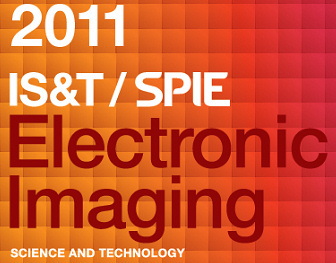 Напомним, что форум Electronic Imaging 2011 проводится в Сан-Франциско, США в период с 23 по 27 января 2011. Перечень планируемых докладов на вышеуказанных конференциях приведен ниже. Session Chair: Qian Lin, Hewlett-Packard Labs. Session Chair: Kathrin Berkner, Ricoh Innovations, Inc. Session Chair: Jerry Liu, Hewlett-Packard Labs. Session Chair: Zhigang Fan, Xerox Corp. Session Chair: Jan P. Allebach, Purdue Univ. Session Chair: Scott A. Craver, Binghamton Univ. Session Chair: Adnan M. Alattar, Digimarc Corp. Session Chair: Jessica Fridrich, Binghamton Univ. Session Chair: Regunathan Radhakrishnan, Dolby Labs., Inc. Session Chair: Chad D. Heitzenrater, Air Force Research Lab. Session Chair: Ton Kalker, Hewlett-Packard Co.